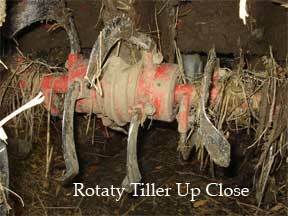 Rotary Tiller or Rototillers - Is One In Your Gardens Future? Rotary Tiller or Rototillers – Is One In Your Gardens Future? Answer: Adding a rototiller to your home garden tool set can save you hours of back breaking work. Selecting the right roto tiller with a design and right power that fits you will make for an easy way to level the garden and do soil preparation. No one wants to spend a beautiful spring day outside in their garden turning soil with a spade or fork, when with each and every movement all that runs through their head is the vision and sound of a powerful tiller breaking up and turning the garden soil like a hot knife through butter. Once the pain relief medicine for the aching back has kicked in, the temptation to run down to the store and buy a garden tiller loaded with power to eliminate the spring garden task can become great. You sell the idea to your spouse by claiming how the weeds covering the garden will be flipped, buried and turned into compose with a new rotary tiller. Or, working the cover crop into the soil to enrich the earth or blending in organic material from the compost pile will be made so much quicker and easier in garden soil preparation. On top of all that a roto tiller with it’s rotating tines is one of the easy ways to level a yard and garden. While it is correct a rototiller can make short order of handling garden soil prep, the tool if not matched to your needs and abilities can create more problems and pain then just hiring the job out. Great powerful tools like a power tiller in the wrong hands makes for a bad relationship. Just as with lawn mowers and other power equipment, as the horsepower goes up so does usually the cost and garden tillers are no different. If your garden is large say somewhere in the 5,000 square feet range plan on your power tiller to be a machine with at least 6 HP (horsepower) or more. Troy-Bilt is one company making these big two-wheel garden tillers (usually with two-wheels) like the rear tine “Big Red” horse, most in this size range in price from $700-$3000 to meet the demands of a large garden. Smaller gardens will find the HP drop a little to have engines with 4-6 Horsepower and run somewhere between $450 to around $900. As you step down you will find what are called mini-tillers or cultivators ranging from $150 – $450, for many a homeowner with a small garden out back mini-tillers are just the ticket.These are often light-weight and can even be electric powered – making the extremely quiet, but messing with an electric cord is a problem. They do a great job in the garden to dig a hole and get the dirt out. Models with more HP come with all kinds of bells and whistles, one you may consider is a model with an electric start. Other possible accessories are furrowers, dethatchers for the lawn, edgers and others. The really big models can even handle doubling as a log splitter. Anytime you deal with power equipment, safety is an issue. Look anti-kickback features, tines which are self-cleaning, starting systems with safety switches and some with noise reduction. It is always a good idea to search the web for some customer reviews and opinions on models you are looking at. The purchase of a rototiller is a major one for many gardeners. One question you should ask is – Do you really need to buy a rototiller for your garden? Would renting a garden tiller for the few times you use it every year be a better way to go? Depending on your physical shape, hiring the job to rototilling you garden may be better hired out. Look for landscape companies that may offer it in your area or search the classifieds. There may be some people wanting to get some money back on their garden tiller investment and can make short work of your garden for a small fee. Some argue a rototiller ruins soil by destroying the texture by tilling the soil at the same depth repeatedly. Most tillers can adjust the depth at which the operate. But, few can argue how well a rototiller can aid in soil preparation by mixing and incorporating organic material and other soil amendments into the soil to help enrich it.